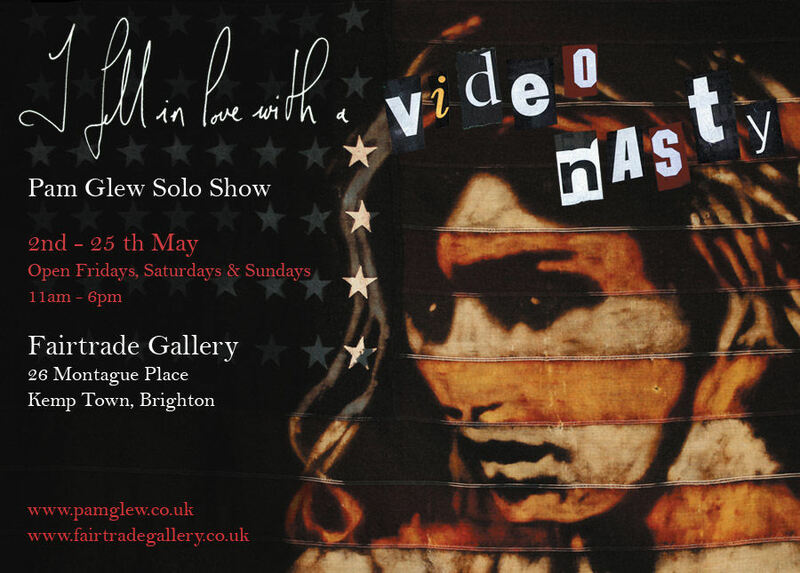 The Fair Trade Gallery, Brighton’s truly independent creative space is proud to present the powerful iconic work of Pam Glew, one of the cities most exciting and innovative artistic talents. Working directly on vintage fabric and American flags and inspired by her love of obscure horror movies, she pays with our notion of paranoia, attraction and the ‘American Dream’. Expect to see portraits of actresses in horror films made by dying and bleaching vintage national flags, alongside stitched text based work made with gold thread. Her popular ‘fear’ series on pages of horror books will be on display, which were recently shown in an International Street Art show in Hollywood, Los Angeles. The exhibition runs every weekend in May. We arrived in Shoreditch at around 3pm on Wednesday and there was already a queue of very cold looking Nick Walker devotees congregating outside the Black Rat Press for the show print. On Thursday evening we made our way to the exhibition guided in by red vandal balloons tied to lamposts down Shoreditch High Street. When we finally got in the first piece on the wall was the coveted Life’s Too Short print and what a print it is, with its glitter and varnish finish it looks quite something. Worth a 30 hour hour wait in the cold? ……….. probably! The work on canvas was equally impressive, as expected. The ‘vandal’ had obviously been a busy boy. Tokyo, Vandal Atlantic Airways, the US even a couple of rats (could they be Banksy’s? ……. you decide!) have suffered for the sake of the vandals creativity. The intricacy of the stencil work is amazing and certainly pulled in the crowds, the place was rammed, the red dots flew up and it was great to see Nick getting the recognition he deserves and has grafted for. I’m sure the signature hat adorning stag who overlooked the evenings proceedings agrees! A big congratulations to Nick and to The Black Rat Press for putting on a great show. The exhibition runs for 2 weeks so get down there and have a browse, but don’t expect to be able to buy anything! Following on from the huge success of December’s 12 Days of Xmas exhibition in Bristol’s Old Bridewell Police Station, Steal From Work are presenting their second major group art show ‘Not A Penny Off The Pay, Not A Second On The Day’. No preview selling to the great and the good. Anyone can come on opening night and all sales are strictly first come first served! You are currently browsing the Artelgallery's blog blog archives for April, 2008.